The event will last from 9 to 11 a.m. and includes breakfast and photos with Santa. 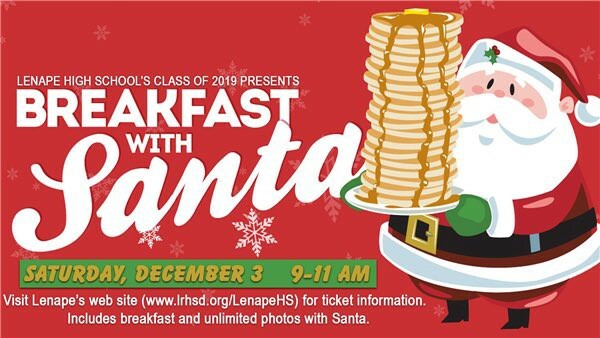 The Lenape High School Class of 2019 is presenting “Breakfast with Santa” on Saturday, Dec. 3 from 9 to 11 a.m.
Tickets for the event will include the price of breakfast and unlimited photos with the man in the red suit himself — Santa Claus. To register for the event, those interested can visit http://www.lrhsd.org/BreakfastWithSanta. Prices are $8 for adults and $5 for children 1 year old and above. Those children under the age of 1 are free. Tickets can be paid for at the door on Saturday, Dec. 3. Guests are asked to enter at the North Cafeteria in the Hartford Road lot. Those with questions can contact Lenape Class of 2019 advisors Claudia Wolf at cwolf@lrhsd.org or Peyton Ebbeson at pebbeson@lrhsd.org.